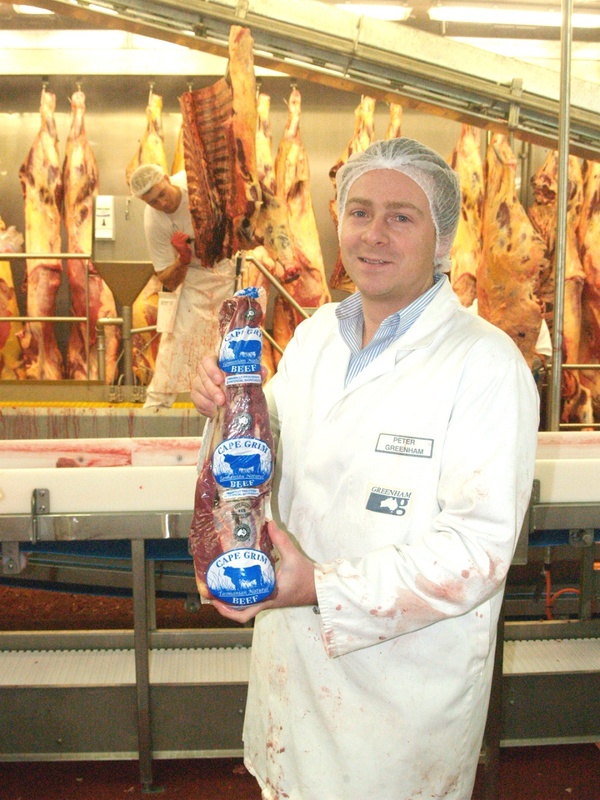 VICTORIAN and Tasmanian beef processor HW Greenham is one of the ‘early adopters’ in the advent of livestock payments for higher-performing carcases within a brand segment’s broader acceptable carcase criteria range. Beef Central looks at performance-based livestock payments within brand programs in this separate story published today. Managing director Peter Greenham Jr said his company had launched an incentivised payment program six months ago on better performing grassfed cattle meeting the company’s Victorian slaughter specs, after buying the Moe plant in Victoria’s Gippsland in October last year, and launching its new Bass Strait grassfed brand program. In Greenham’s case, additional payments for better cattle are based on MSA index performance, with a three-tiered payment system after meeting all other company and MSA specs. From around mid-year, Bass Strait brand program suppliers to Moe have been exposed to three different price levels based on MSA index performance – the boundaries being 55-58, 59-62, and 62+. The premium on an MSA Index carcase of 62 and above, is worth between 20c/kg and 30c/kg over the bottom category. On a 300kg grassfed carcase, that is worth between $60 and $90 a head – a sizeable incentive, in any producer’s language. Cattle 0-4 teeth are eligible for the company’s 100pc grassfed Bass Strait brand program, based on British breeds. “We chose to adopt a payment system based on index rather than marbling score, because that aligns better with how our brands are structured and sold,” Mr Greenham said. Beef Central asked why the ‘incentivised’ performance program was started first at the company’s Moe plant in Victoria, rather than at its Smithton plant in Tasmania where the premium Cape Grim brand is produced. “We plan to introduce it across the whole company, but it just made sense to start at Moe from the outset, given the change of ownership and a fresh start for the plant,” Mr Greenham said. There had been a period at the start where Moe suppliers were unclear about the merit in the program, but they had quickly grown to understand and embrace the change. “They are pleased to see feedback which shows them they have ‘X’ amount of cattle in the highest and second highest groups, attracting the premiums, and the potential to shift more of the lower performers into the higher paying categories within the brand,” he said. He said while there was a lot of talk about future potential to make Value Based Payments on slaughter cattle based on both yield and quality, Greenhams was ‘making a stand,’ signalling by the recent pricing developments that it wanted to pay on quality – first and foremost. “We really want to reward those people who are willing to hold those cattle on, getting them a little heavier and better finished, with a little more marbling,” Mr Greenham said. While the index-based performance payment model had been rolled out at the company’s Moe plant first, a similar model will be used in Tasmania. Greenhams has done a marbling score 3, and 4 and up program out of its Cape Grim grassfed natural program in Tasmania for the past seven years. A move to an index-based payment model on Tasmanian Cape Grim cattle will begin shortly. A similar MSA index-based payment model is also being launched by Greenham on slaughter cows (beef breeds), with a new premium now being paid on cows producing better eating quality scores under MSA. The price incentive is even greater on cows, being 40c/kg between the top and bottom of the three index categories (45-48, 49-55, and +55). The company said it was getting some ‘really good’ eating quality results from the spectrum of its slaughter cows, applying tenderstretching during the chiller process for its ‘Vintage’ brand program. On the better performers based on index, Greenham is consistently achieving MSA four-star rib eyes from better performing cows.